Here is a great educational tool we came across today as we were working on the list of social studies websites for elementary students. 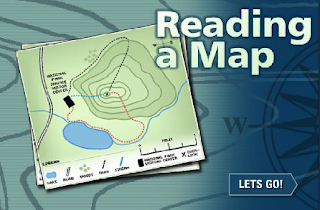 Reading a Map is an interactive web tool provided by the National Park Service that helps students develop their reading map skills. Students get to learn how to read different data on the map, identify major types of maps and navigate their ways through the typography of a map. The tool is free to use and does not require any software installation or registration. To use this map reading tool, head over to this page and click on ‘Let’s go’. Follow the instructions as you go through the slides. The tutorial starts with a quick introduction of what a map is and how it is drawn. Then it proceeds to explain what a Topographic map is followed by a comprehension check exercise. More visually illustrated explanations are provided on the different features of a map and how to locate them. The last section of this interactive guide is devoted to the three constitutive elements making up a map namely : the legend, the scale and the direction indicator. Students will get to learn more about each of these elements and work on exercises to consolidate their learning.